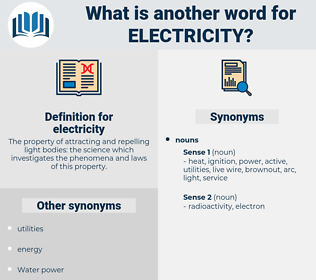 What is another word for electricity? The property of attracting and repelling light bodies: the science which investigates the phenomena and laws of this property. electricians, sources, installations, Lights, Plants. Institutes, lighting, tariff, consumption, stream. 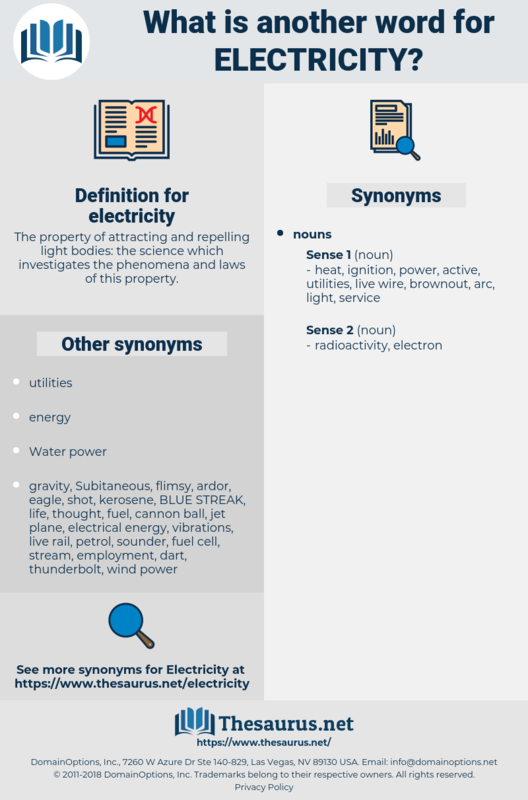 electric, electrification, power, electrician, hydropower. The Ages of Bronze, of Iron, of Steel, and of Electricity. Matter is made up of electricity and nothing but electricity. electrocute, Eleostearic Acid, Elaeostearic Acid, electric socket. hydroelectricity, Piezo Effect, static electricity, current electricity, photoelectricity, piezoelectricity, galvanism, dynamic electricity, piezoelectric effect, thermoelectricity.